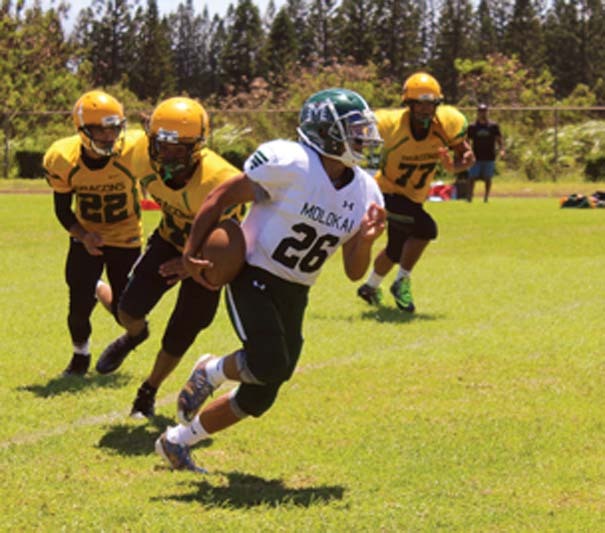 Chevy Augustiro passed for four touchdowns and ran for another to help lead the Molokai High School football team to a 44-13 victory over Hana in a Maui Interscholastic League eight-player game on Saturday at the Farmers’ field in Hoolehua. Augustiro ran for a 49-yard score in the first quarter to give the Farmers (2-1) an early lead. 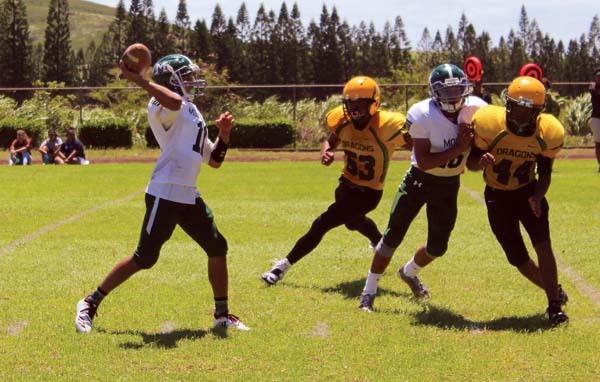 Molokai then broke the game open with a 28-point second quarter that featured three touchdown passes from Augustiro. Kaimana Paleka rushed for a 34-yard score and caught a 10-yard TD pass in the quarter. Kanalu Kahale caught scoring passes of 21 and 15 yards. Chanson Hoopai-Waikoloa threw two fourth-quarter touchdowns for the Dragons (1-2). Mol–Chevy Augustiro 49 run (kick good). Mol–Kamaki Manangan 14 pass from Augustiro (kick failed). Mol–Kanalu Kahale 21 pass from Augustiro (kick good). Mol–Kaimana Paleka 34 run (kick failed). Mol–Paleka 10 pass from Augustiro (kick good). Mol–Kahale 15 pass from Augustiro (kick good). Han–Hau’oli Sinenci 57 pass from Chanson Hoopai-Waikoloa (kick good). Han–Leitin Clark 16 pass from Hoopai-Waikoloa (kick failed).